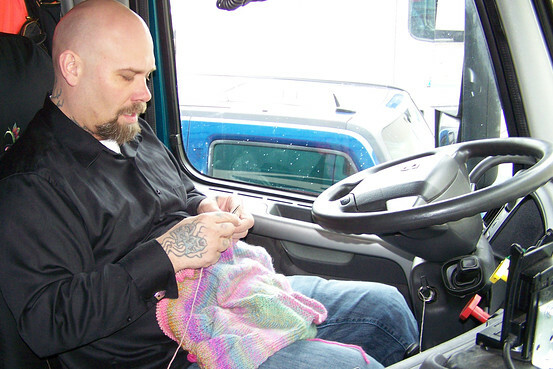 From the WSJ: Kevin Abraham-Banks, a Sioux Falls, S.D., trucker, likes to knit while passing the time on the road. Here he makes a sweater for his wife. Here’s some inspiration for an artist date: try out some textile arts. A recent Wall Street Journal article, “Idle Pastime: In Off Hours, Truckers Pick Up Stitching: With Less to Haul, Drivers Try New Hobbies; Quilting in the Cab,” features truck drivers who spend their downtime quilting, sewing and knitting. The fact that you can take strands of thread and basically make something out of it, that’s awesome I think,” he said. That’s one of the amazing things I admire about the arts: you can take ordinary things and make something extraordinary. I recently started crocheting again while on vacation. The time passes anyway, why not have something to show for it?